At a political demo in London this summer I met a Radical Faerie from Atlanta, the city faerie clan in Georgia that currently has a reputation for being the most active and fertile group in the USA. He told me that he had heard that the Albion Faeries are ‘very spiritual’. By this I don’t think he meant that we go to church on time, or that we all line up dutifully for morning practice, nor even that we are super nice to each other (and compared to some of what I have seen in American sanctuaries, we actually are). He may have been referring to the way we meet regularly to honour the moon cycles, and also to the way our gatherings are built to consciously get the most out of the energies of the seasonal festivals of the wheel of the year. As I feel very fortunate to have discovered very early into my personal spiritual journey, our ultimate task while alive is to follow our spirit, not our given/chosen spiritual path. Fortunate also to have discovered how the cycles of the Sun and Moon, and the rhythms of Nature, give us all we need to liberate the spirit, to heal and awaken the soul, if we become conscious of them. Gatherings are a very effective way of discovering the gifts and subtleties of a season’s energy. The Albion clan of the global Radical Faerie tribe are about to hold our 21st gathering since we first assembled at Featherstone Castle in Northumberland a decade ago at Imbolc 2006. Eight times we gathered at the enchanted Featherstone, our Faerie Hogwarts, during the cold Winter months…. Twice over Christmas and SIX times at Imbolc. These were thermal fashion, finding-divinity-through-the-duvet gatherings, with lots of cosiness around fires, intimate, slow heart circles held at sunset in the blue room (which most people attended) and freezing ballroom discos – divas dancing around the tall radiator heaters not their handbags. The Imbolc gatherings were slow paced, cosy and for the most part mellow. There was a lot of deep sharing and healing going on, also of course an element of high spirited partying, which for some occasionally seemed to become more central to the experience than the healing journey. Whether related to that or not, we experienced a lot of physical sickness at the last few castle winter gatherings. I suggest that if we do not attend effectively to the soul healing that spirit calls us together to address, it is easy for sickness to manifest in our bodies. I also feel that the deep healing work that many of us did engage in for ourselves… and for the collective… during those deep and magical winter retreats (there was one stunning year that it snowed deeply before we arrived and didn’t melt until we left… we were outside doing naked photo shoots in glistening sunshine, we also built a snowhenge) was now done. Spirit was pushing us out of our winter dream time space to explore new territories. The conditions at Featherstone in February were proving too tough, but the wish to continue meeting to savour the sparkling energies of Imbolc, and each other as a respite from the dark winter period, was strong – so gatherings shifted to Paddington Farm in Glastonbury, where space is limited and we have to be cosy with each other. Sometimes it is so exciting to escape the winter blues and arrive in faerie land it can be tempting to forget that the spirit at this time of year is asking us to light a small inner fire, not a conflagration… is inviting us to look within and heal, preparing ourselves for the busier time of year ahead. Imbolc has an exciting energy of potential and promise, but it’s still winter. The Featherstone winter gatherings gave us attendees a powerful experience of deep stillness – because the land holding us was itself so cold and still, while in Glastonbury the earth energy is much lighter and livelier. It does not offer us the kind of deep winter spirit experience that many of us got to know in the Northumberland wilderness. Imbolc is a time to come together for warmth and reassurance in the dark months of the year – the faeries of Albion have explored this season’s energy more than most other clans around the world. Imbolc is also a much celebrated faerie festival in southern United States – an annual Brigit Ball is held in New Orleans, in a very different climate to our northern retreat. So maybe that’s where the spirit of the British maiden goddess emigrated to after her people forgot about her here, somewhere much warmer! In 2014 we gathered for the first Albion Spring Gathering, held over the Equinox shift from winter Pisces water to spring Aries fire energy, discovering powerful magic through consciously making that shift within ourselves in sync with the planet. We returned to Featherstone for this and subsequent Spring gatherings, taking huge delight in the warmer temperatures both outside and within the castle, in the longer hours of daylight, the lambs in the fields and the bright Spring sunshine. 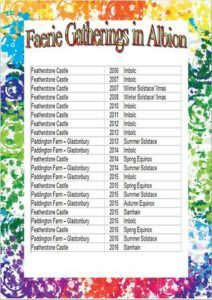 2014 was the year of our second Summer Solstice Gathering at Paddington Farm under the Tor, but the first year the magic really took off there for us. Powerful workshops releasing shame from our lives prepared the ground for a ritual rise into blissful communion around our hot and sizzling Solstice fire in the woods. Many a faerie’s deep rooted dreams of passion and play in nature were fulfilled that night, and our merry mystical dance with the woodland spirits has continued at the Solstice gatherings since. 2014 Solstice brought a glorious sunrise witnessed by many Fae up on the top of Glastonbury Tor. We arrived there at dawn, a very merry band of kissing, cuddling queers livening up the atmosphere amongst the local hippies and characters of Avalon. 2015 the Albion Faeries filled in the last remaining gap in the seasonal calendar with our first Autumn gathering, Featherstone providing the most perfect setting for 9 days of Samhain sorcery and spooky delight. Within a decade we have held gatherings in each of the four seasons of the year, this seeming to me like a very significant statement from our collective to the cosmos that we are not messing around, the Albion Faeries are a spiritual tribe and we mean business. An issue that comes up for us, it seems every few years, is around substance use and abuse. The issue seems to arise when we have become accustomed to a venue and start to take the magic for granted. Or maybe we just get lazy about doing the work that opens the gates to it? When we cosmic queers gather together and open the gates to the heart and spirit we are inviting the potent powers of the universe to come be part of the journey with us. Those powers answer the call gladly when they feel the sincerity behind it, and they bring the possibility of profound awakening and transformation to our conclaves. Having invited super powered cosmic guests to the feast it is silly to ignore them, and seek illusory transcendence through quick fixes. Sometimes of course suitably blessed and prepared sacraments are part of the exploration of our faerie nature that we undertake. As we are in community space and not a gay holiday camp it would seem vital. and natural that those using substances as part of their experience would aim to do so consciously, with awareness given to how their choices impact on others. Our self-defined and self-declared community has grown rapidly in a decade. Is this the moment for us to take a collective breath and consider how, where, when and why… we do what we do. Our last two gatherings at Paddington have led to some disturbance and, it seems, division, amongst us. By contrast the last two Featherstone outings have been extremely well blessed on all counts. It is noticeable to me that while the castle gatherings have had several faeries stepping forward to be part of the organising team, there has been a shortage of new energy in the Glastonbury team. There even seems to be some element of ‘consumer’ culture seeping into Paddington. I also think we have been sticking to a tried and tested formula in our gathering spaces and not really adapting fully yet to the differing energies of each season. What works for a cosy Winter or lazy Lammas retreat may not be the best formula for the highly individuated energies of the Summer Solstice. These high energy gatherings, which have become very large very quickly, could perhaps be held more ‘lightly’, with less expectation of a tightly bonded faerie unit than at other times of the year. They could be more like a faerie ‘festival’ than a conventional gathering. It simply does not seem practical to expect large numbers of fae to achieve the type of bonding and intensity that we know so well when our numbers are so large and the space we are occupying is also used by other people, when we are so close to the attractions of Avalon and when the Sun energy is at its peak. But a less formal faerie festival that embraces these factors as gifts might manifest a lovely energy. 2017 looks like being a different kind of year for the Albion Faeries. Featherstone Castle has been booked for a Global Gathering in August, to which we will invite a number of activist queers from countries in Africa/Middle East/South America/Eastern Europe/Asia to come tell their stories and have an experience of the kind of compassionate community the Faeries create. This gathering is being run in collaboration with the organisers of the first Global Gathering in California held two years ago. With a limit on the number of places the organising team is asking only faeries who feel passionate about the global rights of lgbtq people, and who wish to input into the creation of a global queer shamanic conscious community, to come along. The castle has not been booked for a Spring gathering next year, Team Butterfly figuring that after 3 successful Spring events there a fallow year was appropriate. Dates have been booked for October. 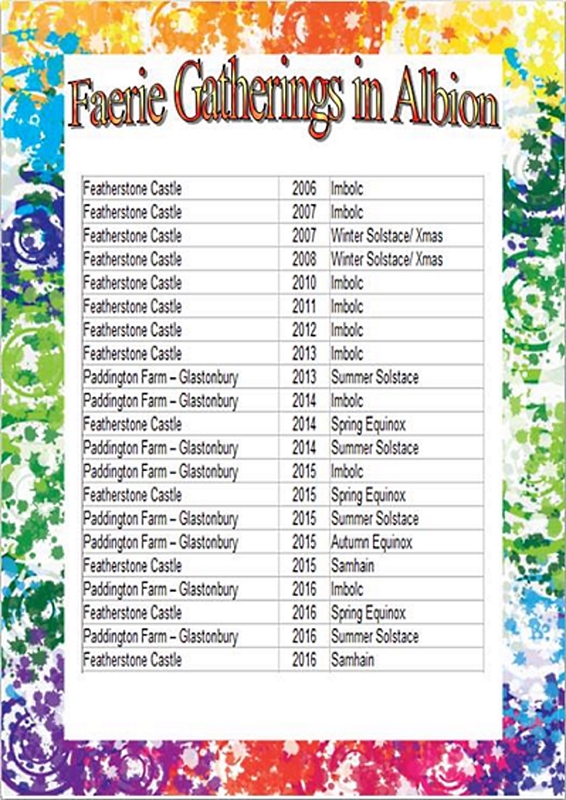 Imbolc at Paddington Farm is booked for us but as yet I believe there is no organising team for a Summer Solstice gathering. I think we could consider also taking a year off from the Solstice gathering, giving time to reconsider how we gather in that space should we wish to continue using it. This potentially would leave a huge gap between our Imbolc gathering and the August Global, and both of these two have restrictions on the numbers that can attend. Could this space be an opportunity for new initiatives to manifest? To perhaps try out smaller gatherings in new locations, perhaps built around themes that some people wish to explore? I would also like to encourage as many Albion Fae as possible get off our little island and go experience the spirit at American and Euro Faerie sanctuaries, to make connections with other parts of the tribe and learn from how they do things. The Albion Faeries are part of a global network of queer healers and agents of change and transformation. There is surely something significant about the Radical Faerie spirit finding a home in the pagan homeland Albion, reaching here via the United States and European gatherings and sanctuaries. We are exploring the crucial link between our sexuality, nature and consciousness, we are birthing the Age of Aquarius. We are also a crucial beacon for lost, confused and abused queers who are not finding their place in the soulless modern world, nor in the shallow end of gay life. We offer a plunge into the radical depths of being, and a lot of fun while plunging. It is well worth us taking stock of what we have achieved and plotting a way forward with consciousness, compassion and care. The Albion Faeries are a ‘very spiritual’ clan of queer magicians, a fact that needs to be properly honoured and understood as we enter our second decade of community building.